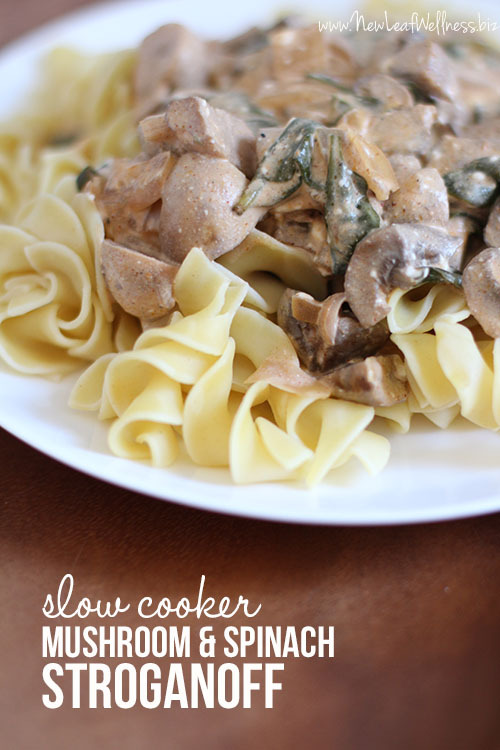 Here’s a recipe for mushroom spinach crockpot stroganoff that your family is sure to love. This vegetable version of the classic comfort food is the perfect way to transition from Winter to Spring! My family could take or leave meat, which is quite contrary to the way that Kelly’s family eats. (Wouldn’t it be a very boring world if we were all the same?!) Don’t get me wrong, chicken is still a staple in our house and my four-year-old recently told us that bacon was his favorite “meat food”, but I, personally, don’t eat red meat…so, my husband and children reserve it for when they are out or dining in other people’s homes. I’m a pretty nostalgic person and I often find myself reminiscing about the food that my parents made when I was living with them (a very, very long time ago). I often challenge myself to take those old favorites (such as beef stroganoff) and adapt them to my current eating style. 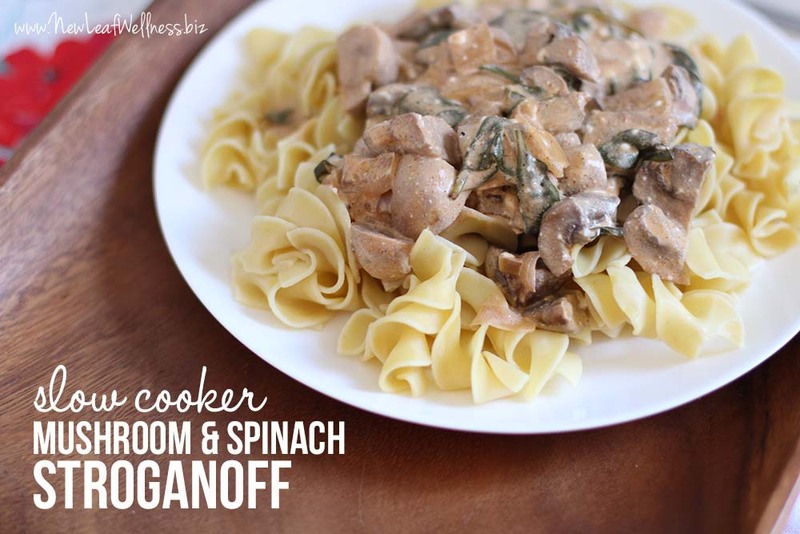 Serve your mushroom spinach crockpot stroganoff with egg noodles and a big green salad. Place butter, mushrooms, onion and garlic in crockpot. In a separate bowl, mix together broth, sour cream, ketchup, Worcestershire sauce, black pepper, and paprika. Cook on “low” for 7 1/2 hours. Add cream cheese and spinach. Cook on “low” for 1/2 hour or until everything is heated through and spinach is wilted. This sounds delicious! 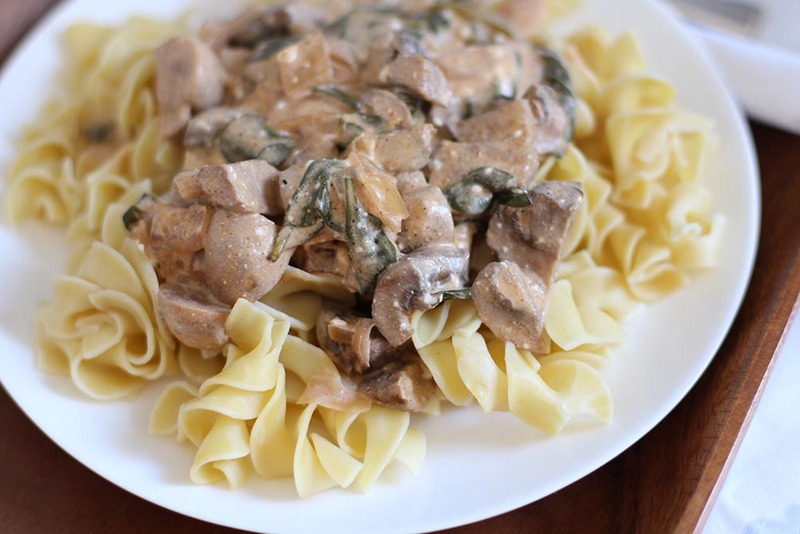 My mom made beef stroganoff on a regular basis when I was a kid, so I’m looking forward to trying this version. Can this be prepared and frozen ahead of time? Yes, I think so. I would still add the sour cream toward the end of the cooking time though. I’m not sure how it would do all day in the crock. I’d just wait to add the cream cheese. Would you wait to add the spinach too or would you freeze it with the rest? Sounds amazing…but the ketchup seems a bit odd; is it necessary? I’ve only tried it with it and it’s delish. Ketchup is what I use in my traditional stroganoff for richness. I would say yes. This recipe has two 7 1/2 hour cooking steps. Is that a typo or does it take that long? The cooking time is the same regardless of whether it is cooked fresh or frozen first. 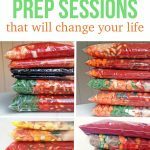 If you decide to freeze you don’t do any cooking ahead of time. This sounds yummy! So to make this a freezer meal do you just throw all the ingredients into a freezer bag? Thanks! Yes. I would wait to add the cream cheese until the end of the cooking time though. Cream cheese at the end or sour cream at the end? In one post you said sour cream and then today cream cheese. New follower and terrible cook trying to do better haha Thanks!! The post says cream cheese. The sour cream is added at the beginning of the cooking time. I followed the recipe and when I left it to cook for 7.5 hours, it burned pretty bad. Any ideas to prevent this? It was probably overcooked. 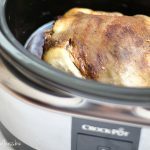 How big is your slow cooker? I would decrease the cooking time next time. Am I correct that I take all of the ingredients raw and put them in a freezer bag (except cream cheese) then freeze. Day of cooking put everything in the crock pot. Do I cook garlic and onions before putting in the freezer bag? Thank you!!! 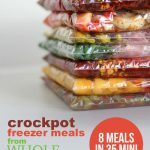 Is it possible to freeze this recipe in a bag before cooking? Yes, definitely. Just wait to add the cream cheese until the day of cooking. Made this tonight, but my hubby has to have meat in everything. So I browned some stew meat and added it to the beginning of cooking. It was AMAZING! He went crazy over it. Thanks so much!